Mirissa Beach, far from the maddening crowds. We arranged a tuk-tuk to the bus station in Galle and jumped on the next bus in line for Mirissa. As it was the starting point, we managed to both get seats – bonus! The bus follows the A2 around the coastline (at break-neck speed) and is quite a picturesque trip. 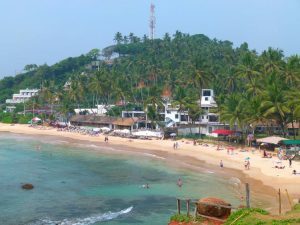 It takes about 2 hours to Mirissa and it dropped us off in the main street. Another tuk-tuk drove us up to the Green Mountain Rest Guesthouse, about a km from Mirissa Beach. we’d found it on Airbnb and it was great value at less than USD 12 (AUD 16) per night including breakfast. Our room was clean but small with a large bed covered by a mosquito net and had a private bathroom. Choose the sun or the shade. The family was really nice and helpful and gave us lots of information about the place and said they would arrange a scooter for the next day. By now we were hungry, so we wasted no time hiking down to the main beach for lunch at the Zephyr Bar which has an unspoilt view along the whole main beach. Once fed, we took a stroll up the beach to the far end. 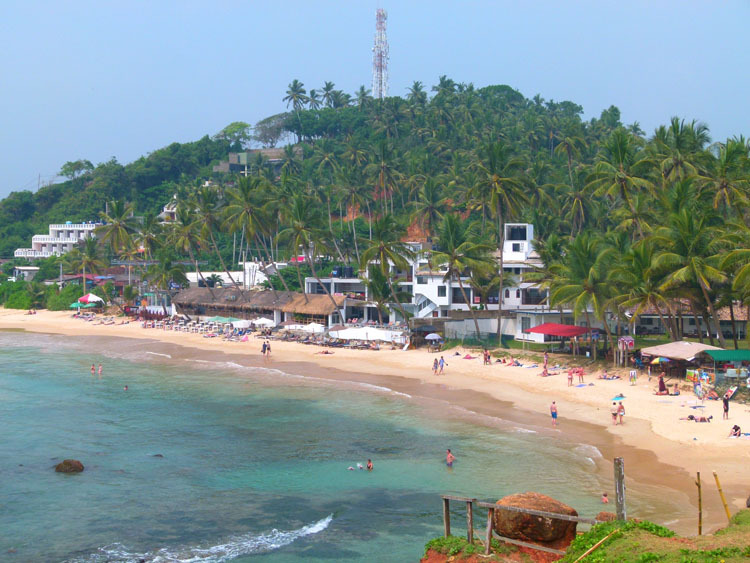 Mirissa is a good beach for swimming and the sand is the finest we’ve seen so far. Walking around here at night can be something of a challenge for the uninitiated. The main highway through town (A2) is a real rat-run of a road and a bit dangerous to walk down if you’re not paying attention. Speeding intercity buses blare their horns as they barge their way suicidally through town scattering all traffic in their way. Not to be put off easily, tuk-tuk drivers play “chicken” with them, narrowly avoiding catastrophic collisions by centimetres and without batting an eyelid of concern. Unfortunately, the whole A2 along the coast so far is the same! 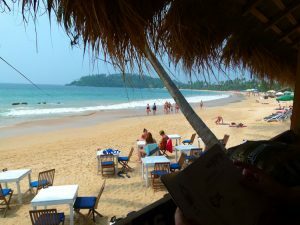 As we soon found out, prices in Mirissa are a bit more expensive than in the backpacker-friendly Hikkaduwa. Rice paddies away from the beach. We hired a scooter for the next 2 days (1000Rps/Day = ~USD 7) and around lunchtime (after some work), we headed into the countryside, making our way down narrow, winding roads that cut through verdant rice paddies bordered by masses of coconut palms hiding small rural cottages. It was Sri Lanka as I’d always imagined it. We came back down the coast road and motored on through to Weligama, a popular surf beach, then onto Koggala which is known for its fishermen who climb up poles in the shallows to sit and fish for hours, a truly strange sight! Using just a stick and a simple line with a small hook, they have been doing it like this for ages, simply because it works! How sore their bums are after a while is anyone’s guess! Not the most comfortable way to catch a fish! We returned in time for some beers and the sunset down at a small cove adjacent to the main beach and closer to us. It’s a really chilled out atmosphere here at night. No loud music or shouting, just sit back and enjoy – perfect! We elected not to go on the Whale Watching Tour as it was too expensive and we’d seen them in New Zealand and Queensland already. We’d also been warned that we might not approve of some of the “watching” methods ie: herding the whales with the boats! 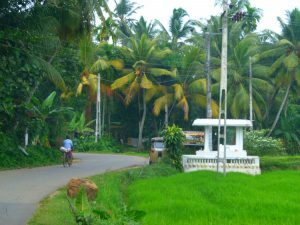 Instead, we took the scooter up through Matara, the nearby big town. Here we sat in traffic most of the time inhaling the exhaust fumes of a thousand buses. Funnily enough, this didn’t put us in a great mood. Once out the other side, we headed inland again through Matara’s surrounding districts. Threading our way through the maze of tiny lanes no better than tracks for the most part. The entire district is enveloped in a tropical forest that hides the houses in shade most of the day and plays out over several large hills. 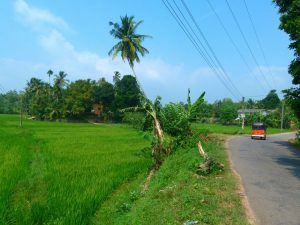 More than once we relied on Shazz’s GPS on her phone to get us back on track and heading home again – back through Matara! 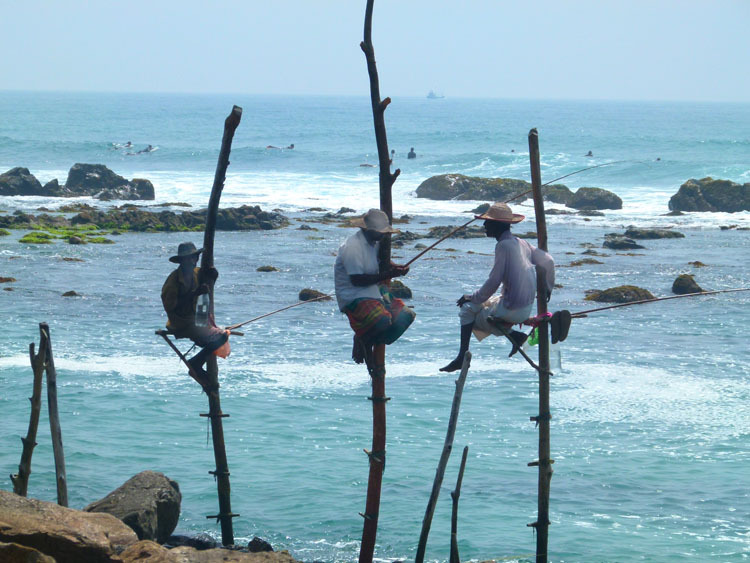 Having enjoyed Mirissa, we now head further east to the small town of Tangalle. Quiet country lanes away from the beach. Tired of the beach? Hire a scooter and head inland and do a tour of the rice paddies. There’s many a hidden gem amongst the palm forests and the word “exotic” frequently comes to mind. NOTE: You are not likely to be covered by your travel Insurance if you don’t have a valid motorcycle license in your home country and a corresponding International Driving Permit (IDP). But even that’s not enough to drive legally here. If you want to ride a motorcycle you must have your IDP validated by the Sri Lankan Automobile Association. It takes less than 30 minutes and for around USD 25, it’s totally worth it. Traffic is quite chaotic and accidents quite common. Not only that, we saw the local constabulary targeting tourists on scooters in the popular beaches and I believe the fine is over 2000 LKR ~$15. If you have the right license then World Nomads will cover you in the event of an accident. That’s just one of the reasons we choose them. Take care choosing a reputable Whale Watching tour, there are some dodgy ones (even fake ones who’ll take your money). Ask at your guesthouse for a recommendation or check your guidebook if it is up to date.